I never expected to get invited to a Lush event but Lush Croydon asked on instagram for people to apply for their first ever blogger event and I honestly thought I would not make the list for the actual night based on how many die-hard Lush supporters there are locally and how many of them have amazing social media. A year ago I would never have even applied or dared to go to such an event and barely stepped inside the shop as money was tight and I needed bubbles super cheap regardless of the quality. But I made it on the list and made my way there after work and survived the entire evening. You know how there is always that really awkward person in the room? That person was me but now I know the people that were there I would be a lot more relaxed and able to be myself. But anyway enough about me let me tell you about the amazing event! 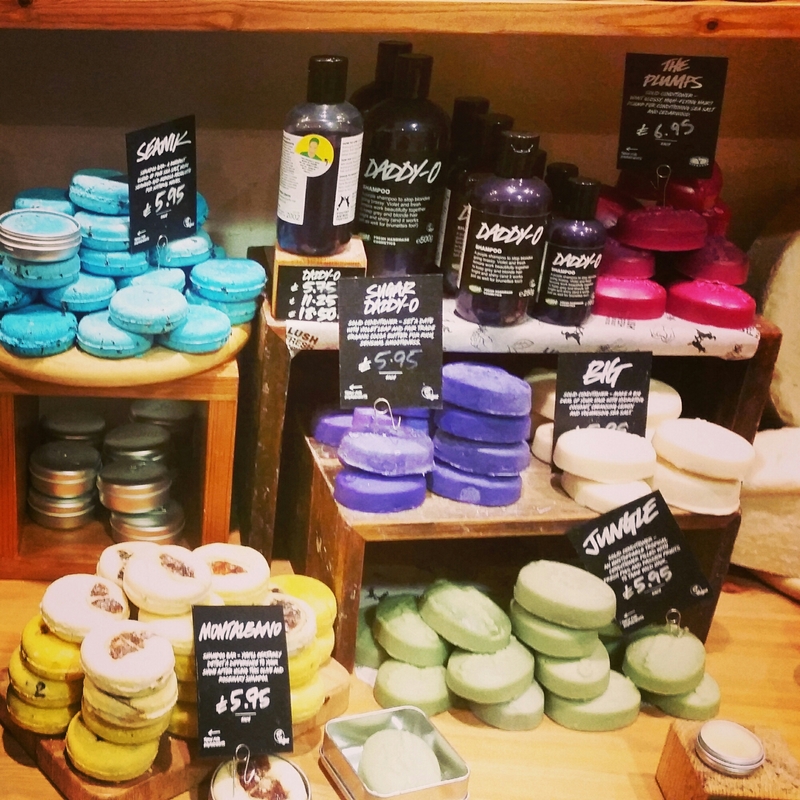 It was so bizarre being inside a Lush shop after closing. Not just because people kept trying to get in and finding they could not but because it was so well stocked and yet so empty. I find going into Lush, especially around Christmas, still be one of the more stressful shops as everybody sends their hands rushing for the best looking santasauraus so to be able to see so much floor was incredible. 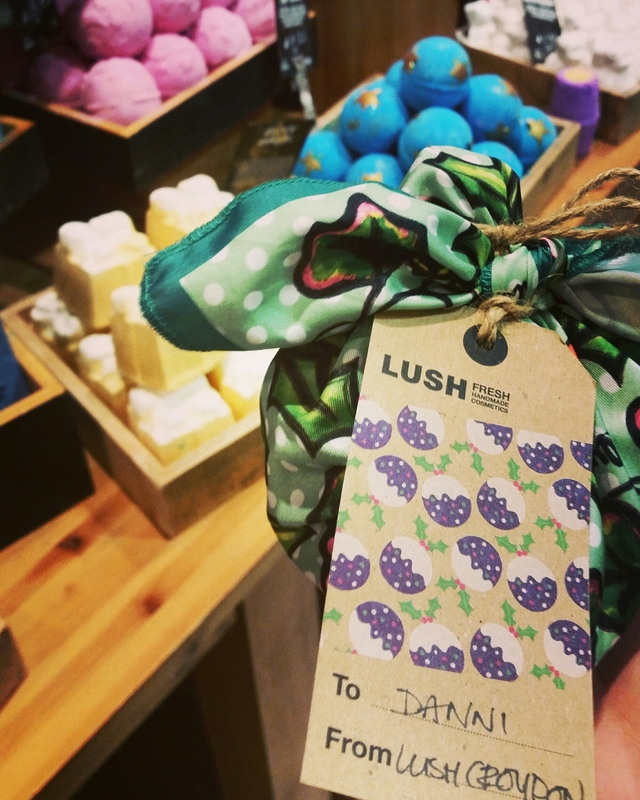 There were just pretty things everywhere and it still had that delightful Lush smell as you walked around the store. It really gave me a chance to see everything clearly without feeling rushed and in doing so helped me to figure what I would choose during standard open hours or via the website. This section always looks good enough to eat! We did a variety of activites including watching a bomb fizzle away in the water to reveal its inner magical colour and glitter. It is one of those things that I always feel real awkward about them doing in store because they are products people would pay money for and if you do not end up purchasing one it is like it went to such needless waste. But here it felt much more natural and it allowed us to just enjoy it and watch rather than pondering on whether to purchase or not. Lush staff, especially the ones with us that evening, are incredibly friendly and will do anything to try help you out to ensure you like the products you pick up and that friendly attitude and interest in the products they work with really came through during the evening. Their knowledge on different techniques for different products and the ability to discuss individual ingredients in items showed their love for the products in a personal capacity as well as a professional one. We were all amazed by just how many bubbles could be got from a tiny swirl of a santasauraus in some water in a jug before moving the water back and forth. I normally break them up and put them into a sieve diretly under the running water which thanks to reasonably high water pressure produces a decent amount of bubbles but nothing quite like the jug method. There was a lot of remarks amongst us that we might have to ask for a couple of jugs for Christmas. 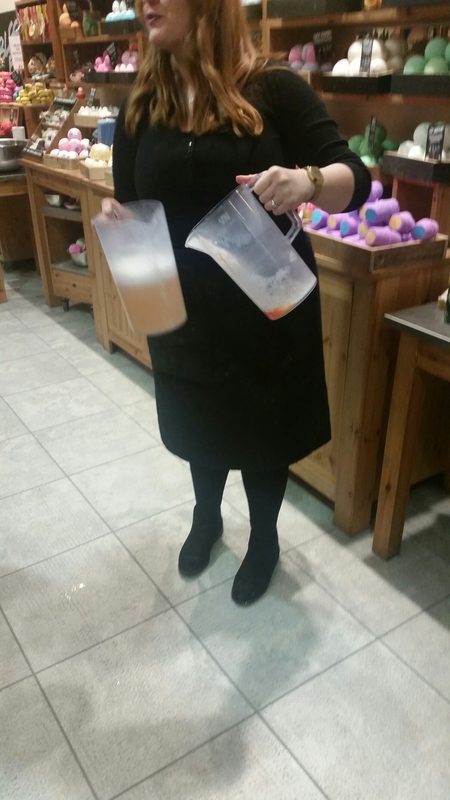 Everybody else had a go at moving the water around with several different products inside including two different shower gels but I decided to pass as my clumsy nature is quite well known especially when tired after a long day of work! All of the products put to the test and mixed together smelled absolutely incredible and I would happily spend an evening in a bath surrounded by them whilst others would be just enough for a bath time. And until the event I never really rated Rose Jam but I think I might have to get some when running low on products. If all that was not exciting and fun enough to do we got to make our own Ruby Red Slipper mix and find out about the process that goes into making some of the winter range. 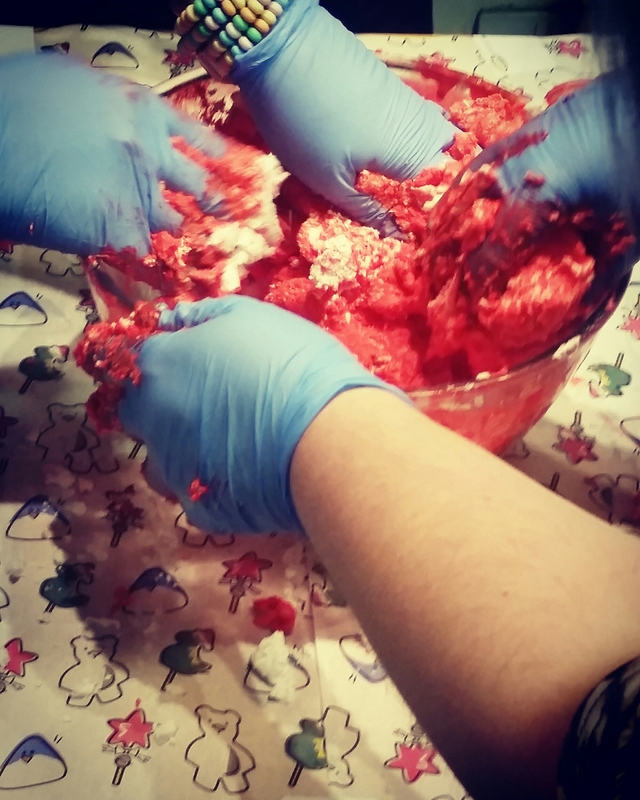 It was so much messier than I expected it to be and the process was rather like making a Christmas cake where it needs a lot of work to mix everything together properly but the vibrancy and smell of the product at the end was worth it. 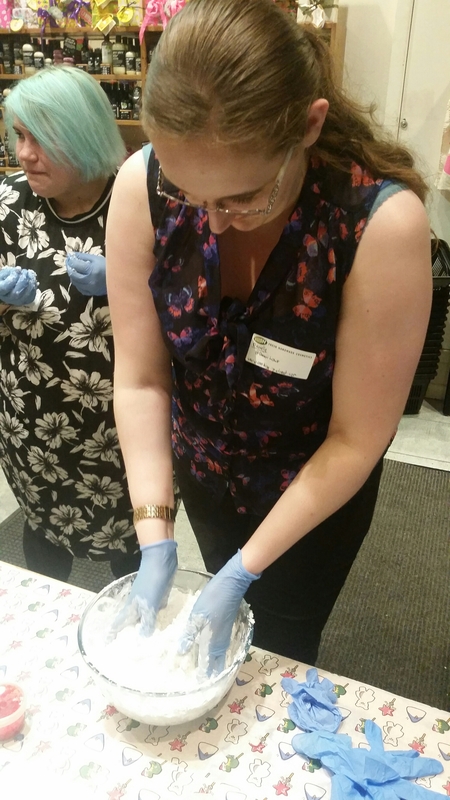 We then went off to let them set a little, though this would need to be done at home overnight, and received the sweetest little knotwrap gift from the Lush Croydon team! It was such a generous and thoughtful thing for them to do and I especially loved the holly themed Christmas knotwrap (I honestly would have been happy with just that!). Because I am just getting back into Lush products and being able to treat myself I am a little out of what products are around and what the older ones even still smell like so getting this little gift was extra useful to me! The products received will help me remember which scents I like and what product style I like to use most for certain things. 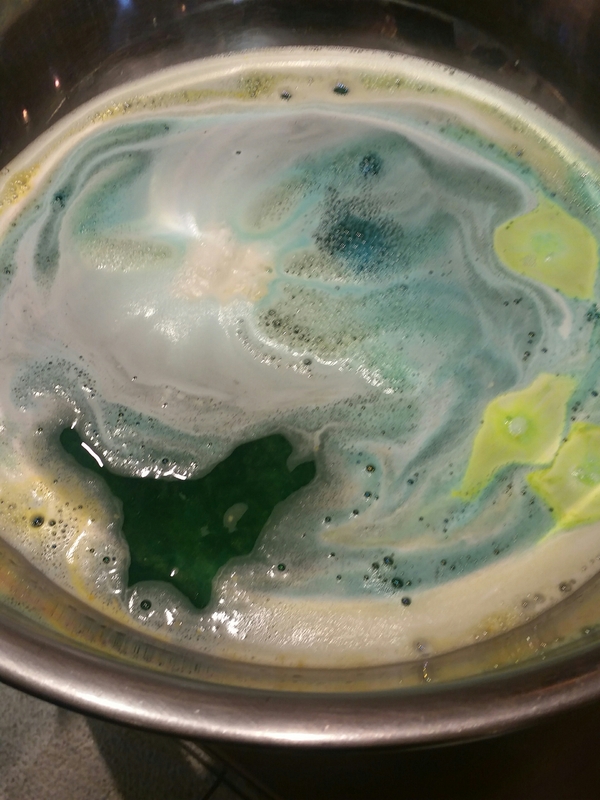 Lush is an art that I am looking forward to increasingly getting back into. 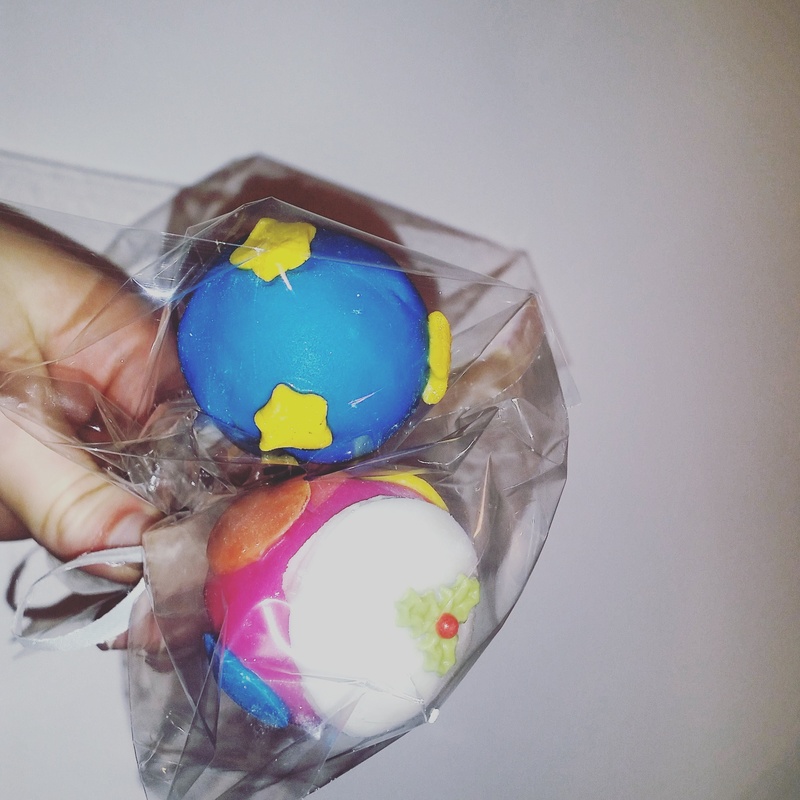 Not only was there amazing company and the chance to explore the products better there was also cute food and drink including Lush based cake pops by Lush By Night that were flavoured to represent the scents and flavours. They tasted delightful! 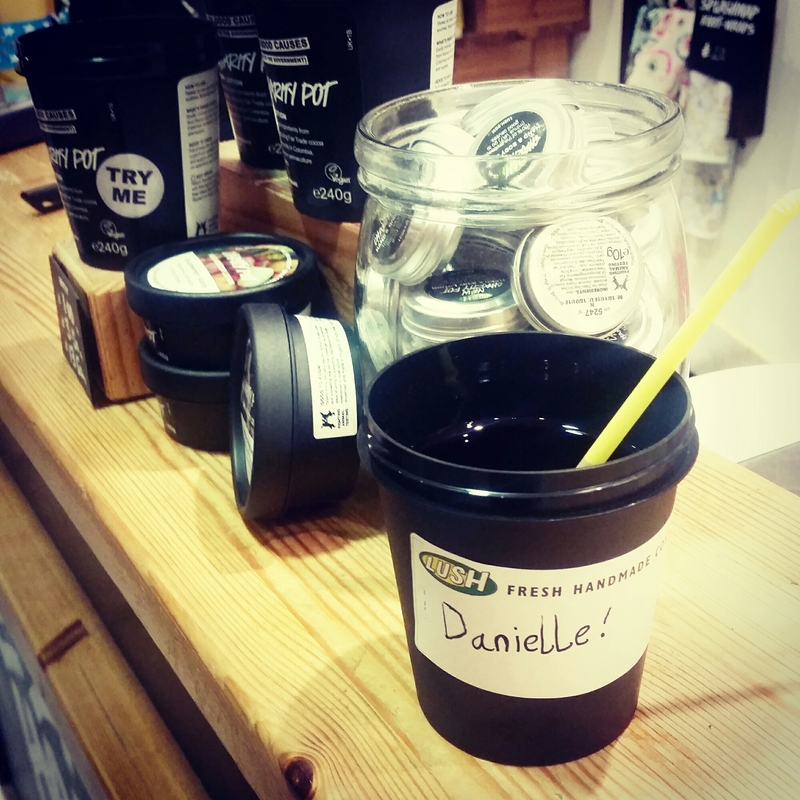 We also got to drink red grape juice out of Lush product tubs, such as that a charity pot would be made out of, and there was something about it that was very cute and enjoyable. Mind you gove me anything that is not an actual glass and a straw and I am pretty much won over. It was certainly far better than a flimsy plastic cup that is for sure! Overall I had a fantastic night. I did feel a little out of place due to the levels of knowledge everybody else seemed to have on really specific things but I found the night really useful and so much fun. There are certainly more ideas going around in my head now about which Lush product to try out next.. though for the next month or so I might have to stick to online shopping rather than in store. Most Lush stores have blogger events or similar events to what we did for birthday parties and could be a great thing to do with your friends instead of the usual trip down the pub or to some average restaurant you just go to because it pleases everybody. Thank you to Lush Croydon for inviting me to the event and for being so lovely. a fabulous night and one I am delighted to have attended. This entry was posted in Bath/Shower, Beauty, Lifestyle and tagged bath, bathbomb, bblog, bblogger, bbloggers, Beauty, beauty blog, beauty blogger, beauty bloggers, blogger event, blogmas, bubble bar, bubble bath, bubbles, croydon, ethical, event, fairtrade, floral, fruity, fun, lblog, lblogger, lbloggers, life, Lifestyle, lifestyle blog, lifestyle blogger, lifestyle bloggers, London, lush, shower, shower gel, vegan. Bookmark the permalink.